The Reykjavík Chamber Orchestra was founded in 1974 under the leadership of Rut Ingólfsdóttir. It initially comprised a dozen young musicians who had recently returned to Iceland to perform with the Iceland Symphony Orchestra and teach at the Reykjavík College of Music after advanced music studies abroad. The ensemble was founded with the dual objective of offering the public regular performances of chamber music from the Baroque era to the twentieth century and of providing performing musicians with varied and challenging performance opportunities. It can be said without hesitation that the Reykjavík Chamber Orchestra, now one of the cornerstones of Icelandic musical life, has succeeded in its mission. 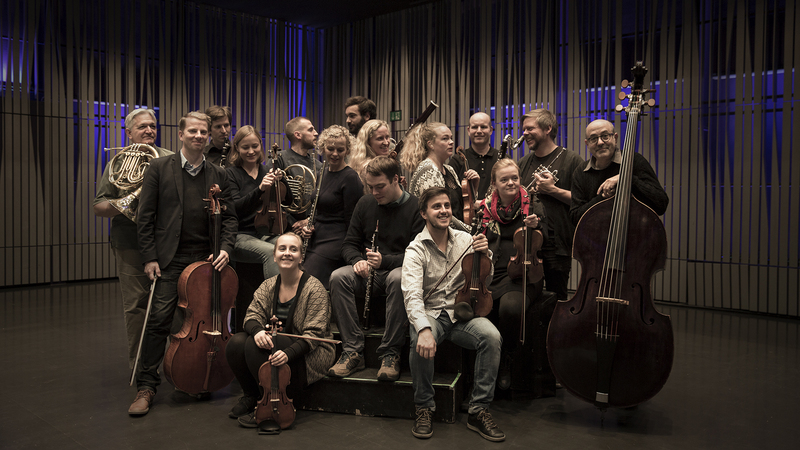 The Reykjavík Chamber Orchestra appears in diverse groupings ranging from 3 to 35 players; its size and instrumentation vary according to the projects at hand. Its members remain active in the Iceland Symphony Orchestra and as teachers and free-lance performers, but they share the goal of enriching Icelandic musical life with performances of chamber music from various periods. Thus the Reykjavík Chamber Orchestra’s objectives remain as valid today as they were at the time of the ensemble’s founding three decades ago. The Reykjavík Chamber Orchestra is well known for its wide-ranging repertoire and excellent performances, among them its highly popular Christmas Baroque concerts. The group has premiered a host of Icelandic and foreign works, many of which have been composed especially for it. Moreover, the Reykjavík Chamber Orchestra has given Icelanders the opportunity to hear many masterpieces of Western music never performed in Iceland before: works such as Pierrot Lunaire, Serenade, Chamber Symphony #1, and other works of Arnold Schönberg; Quatuor pour la fin du temps and Des Canyons aux Étoiles by Olivier Messiaen; Façade by William Walton; Fratres, Te Deum and other works by Arvo Pärt; and the music of such composers as Lutoslawski, Adams, Gubaidulina and Boulez. The RCO has worked with a number of distinguished conductors, including Vladimir Ashkenazy, Paul Zukofsky, Jaap Schröder, and Reinhard Goebel. The ensemble performs regularly, both in Iceland and abroad, and has recorded extensively for Icelandic radio and television. It is a frequent guest at the Reykjavík Arts Festival and has appeared at numerous music festivals in other countries. The Reykjavík Chamber Orchestra has been a cultural ambassador for Iceland at EXPO 1998 in Lisbon and EXPO 2000 in Hannover, as well as on tours to Japan and China. In May 2003, the RCO toured Belgium and Russia under the direction of Vladimir Ashkenazy. In October 2004, it performed a programme of Icelandic music at the Icelandic Culture Festival, Islande de glace et de feu [Iceland, Land of Ice and Fire] in Paris. That same year the group received the Icelandic Music Award for its recording of Johann Sebastian Bach’s Brandenburg Concerti, performed under the baton of Jaap Schröder. In recent years, the RCO has made an effort to record and issue on compact disc the large number of Icelandic works that have been composed for it. The resulting series of CDs features the ensemble’s chief collaborators among Icelandic composers. The Reykjavík Chamber Orchestra proudly presents Siggi String Quartet whose memers are all core players of the Reykjavík Chamber Orchestra. Reykjavik is hosting the Nordic Music Days 2016, one of the world’s oldest music festivals, founded in 1888. The Reykjavik Chamber Orchestra’s annual Christmas concert is one of main events for many to set themselves into the Christmas spirit. The program, as always, is composed of music of the baroque era. At this year’s concert we hear Iceland’s well known Kristinn Sigmundsson sing with the Chamber Orchestra and one of the worlds finest harpsichordist’s, Jory Vinikour, will be conducting the concert and performing the C.P.E. Bach Harpsichord Concerto. Kristinn has performed at the largest opera and concert halls in the world such as The Metropolitan Opera, La Scala. Jory Vinikour has played in concerts all over the world. He was the first prize winner in the International Harpsichord Competition Warsaw and the Prague Spring Festival. Jory and Kristinn met at the Paris Opera where they performed along with Anne Sophie Von Otter in Händel’s Ariodante. In accordance to a cherished tradition the RCO will perform at the annual festival of the Icelandic Composers Society. The Orchestra, has, from the very start, held in high esteem to collaborate with composers and premiere and record their works. On this year’s menu: Brot by Hugi Guðmundsson , Roto con moto by Hlynur Aðils Vilmarsson, Aequilibra by Anna Þorvalds and a new guitar Concerto by Guðmundur Pétursson. Two popular yet very different sextets inspired by memories are the cornerstones of this concert by the Reykjavik Chamber Orchestra. Mladi or Youth by Janacek for winds and the string sextet Souvenir de Florence by Tchaikovsky. Also performed will be the Serenade no. 1 by Martinu for winds and strings.